In the fall of 2015 one of my close friends invited me to join her at a ‘women in tech’ happy hour. I didn't even hesitate. It was an instant Yes. Come to find out it was a small, warm gathering of professional women from a variety of backgrounds and experience. As an introvert, networking can be really draining, but I found this particular event and community energizing. That was the start of my membership in the PDXWIT community and relationships with amazing women who continue to inspire me. After that first PDXWIT event over 2 years ago, I was compelled to continue to network and become part of the tech community. In fact, my experience with the group made me wonder what it would be like to WORK at another company. I had joined a tech company in college, as employee #2, and over 14 years had grown it to over 500 employees as Director of Operations. Surprisingly enough, I realized I hadn't actually been an architect of my career, but rather a passenger; PDXWIT inspired me to become the driver. I started networking and interviewing employees at Portland tech companies to identify which organizations I wanted to work for. New Relic became my number choice, and I connected with a number of employees and recruiters there as I waited for the right position to open up. Fast-forward to early 2017 when I landed my current role in Product Operations at New Relic. I can honestly say PDXWIT was a crucial catalyst in my career transition and transformation, which is why I am still so involved in the community, the mentorship program, and in supporting other women to do the same. Rochelle gave us a few of her topline interests. She’s a problem solver, a builder and loves to develop processes. She has great respect for the power of data. She’s also a fan of organization, clear communication and engagement. These skills have lead Rochelle to serve in another instrumental capacity: as an advisory board member in the entrepreneurial community. Look for Rochelle at the next Happy Hour. 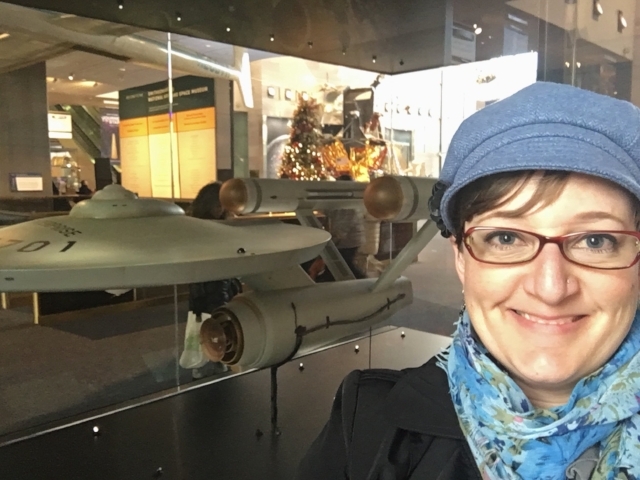 Ask her what it means to be a social introvert, where she found the Starship Enterprise (pictured here), why her Russian Blue cat is named “Spock,” and get her latest take on Game of Thrones.